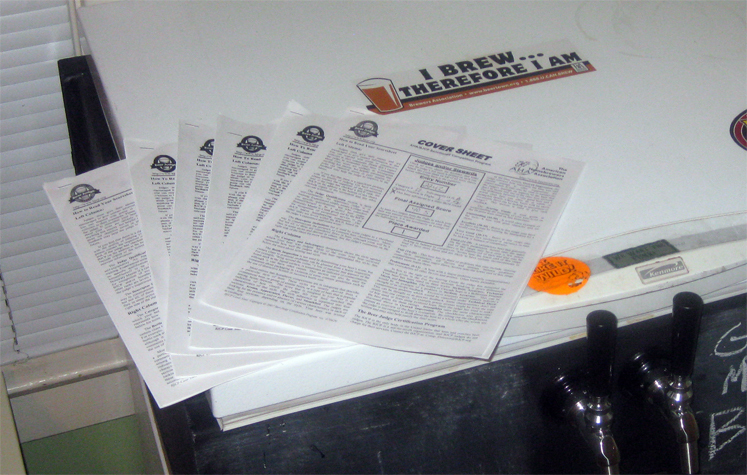 On Monday I received the score sheets back for the six beers I entered in the 2010 NHC. The two judges liked the cherry/plum character, but thought it was a bit too sour for the style. My friend Scott entered the same beer in the Wood-Aged Beer category and it received a similar score, with the main complaint in that case being that it did not have enough "wood character" for the category. I'm really happy with the beer, but I'll concede that it is on the drier more lactic end of the style. One judge had no real complaints and gave it a 35, while the the other said twice that it wasn't "spicy" enough (which the guidelines suggest is optional in low amounts) and gave it a 31. I agree that it is a bit one dimensional, but I don't think spiciness is the answer. No-Boil Berliner Weisse (Berliner Weisse - 40.5 and 1st place in the Sour Ale category! Most of the comments centered around the sharp sourness, and dryness. Luckily the judges enjoyed the complex citrus/apple funk, something I was worried would be a bit too much for the style. Hopefully it does well in the second round. Sour Squash - (Spice/Herb/Vegetable) - 27.5. The only real detraction was the lack of squash/spices for the category, which wasn't a surprise. The judges comments were more positive than their score ("I liked this beer. The sourness had a lot of complexity but was balanced with nutmeg later in the flavor. "), but it is a shame that having a subtle spice/vegetable complexity isn't enough for a beer to score well (who would really want a sour beer with a strong butternut squash flavor?). Both suggested I either increase the spicing/squash or enter it as a straight sour. The judges felt it was a bit too sweet/hot and that it could use some more age. I'll agree on the sweet (although that is one of the hallmarks of the style), but I was surprised that they found it boozy, at 10% ABV it is at the low end of the Eisbock scale and at almost 18 months old it certainly isn't a young beer. I was a bit let down considering a year ago it scored in the high 30s and won a Silver at the 2009 SoFB when it was a much younger beer. One judge thought that the beer had some oxidation, but suggested that additional age might be a good idea. The other agreed on the oxidation, but suggested serving the beer younger. I don't get the paper/cardboard (it is less than 6 months old), but it does have a thick dark fruit character that I could see being confused for sherry. Overall I'm pleased with the scores my beers received. Looking forward to seeing how my Berliner Weisse holds up in the final round. Hopefully it scores well, but it is probably too sour and funky to make it against the 30 best sours from around the US and Canada (of course that is what I always say about my Berliners and in their only two contests each has a 1st). Update: The results for the 2010 NHC have been posted online. Congrats Mike on the Gold! We'll be routing for you in the second round! Weird comments on the Flanders. What was your prize for the Berliner? I just took a closer look at your Berliner results... congratulations again, on beating out Gordon Strong! Thanks guys. No prize/ribbon yet, do they send it all out together after the second round? This was my first time entering, so I'm not sure exactly how it works. Not sure... I had entered my second beer, a hefeweizen, in the Canadian ALES competition to get some feedback from BJCP judges, and it somehow won gold in that category. I think there are prizes involved, but I haven't received anything (including sheets) yet at all. sweet, sounds like a good showing. Congratulations. I imagine the best thing going for you (which I'm not completely sure) is that you'll be one of the few Berliner's in that category dominated by lambics. Hopefully it works in your favor; good luck! Congrats! I got dinged significantly for abundant esters and some peppery phenols in my 16E strong saison. Que sera sera. Congratulation on the Gold. Just so you know, I cheered when your name was announced (I was there judging). Gold Certificate Earned by entries scoring 38 to 50 points in the NHC First Round. Silver Certificate Earned by entries scoring 30 to 37 points in the NHC First Round. Bronze Certificate Earned by entries scoring 25 to 29 points in the NHC First Round. Brewers whose entries place 1st, 2nd, or 3rd in the First Round and have a score greater than 30 points are awarded ribbons for their achievement and the entry qualifies to advance to the Final Round of the National Homebrew Competition. Congrats again on the Berliner, hope its dregs are doing good things to my funky dopplesticke ! Congrats man! Great scores across the board. I am looking forward to seeing how the Berliner does in the final rounds. I managed a 1st place finish in Category 22.